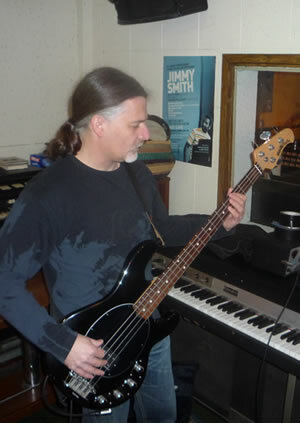 Jerry learned how to play the upright double bass at school, but moved to electric bass not long thereafter. The progression was largely based on practicality, and desire to carry less weight around. In terms of his musical journey, Jerry cut is teeth with local Watford band “Redhouse”, playing a mix of covers from the 60s to the current charts, including Beatles, Jam, Kinks, Rolling Stones, Santana, Jimi Hendrix, Lenny Kravitz, RHCP, Killers, Stereophonics, Arctic Monkeys and more. Jerry joined the Fluffy Jackets in 2007 following their first EP release and played with the band on rehearsals and on a number of gigs thereafter. In terms of bass-playing inspirations, Jerry comments: “I don’t really follow particular people and didn’t really take much notice of who was in which band until more recently, so I don’t really have favourite players but, I am currently enjoying John Paul-Jones playing with Seasick Steve and QOTSA, Flea always gets a mention. Musically I listen to almost anything, although I have a natural preference towards songs featuring a good bass”. On the new Fluffy Jackets debut album, Jerry Bessent can be heard playing bass on two covers which feature prominently in the Fluffy Jackets’ live set, namely Arthur "Big Boy" Crudup’s “Mean ol Frisco” and Woody Guthrie’s “Vigilante Man”. Jerry Bessent is currently working on the upcoming Fluffy Jackets album, scheduled for release in 2018.